Using a comparative and socio-legal approach that emphasises the practical role of human rights, anti-discrimination law and employment protection, this book argues for an enforceable right to reasonable accommodation on the grounds of religion and belief in the workplace in Europe. In so doing, it draws on the case law of Europe's two supranational courts, three country studies –Belgium, the Netherlands and the UK – as well as developments in the US and Canada. 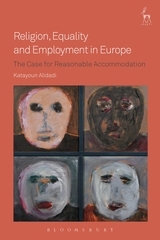 By offering the first book-length treatment of the issue, it will be of significance to academics, students, policy-makers, business leaders and anyone interested in a deeper understanding of the potentials and limits of European and Western inclusion, freedom and equality in a multicultural context. Awarded an honourable mention from the International Academy of Comparative Law for the 2018 Canada Prize! 4. Conflicting Religion-Worktime Demands: Is Europe Keeping Up with the Times? II. Religious Affiliation Discrimination: The Thin Heart of the Matter?